Division of the optic and ciliary nerves as a substitute for extirpation of the eyeball. Journal : Practitioner ; vol. xxxvii. London : Macmillan and Co., 1886. Description : 351-352 p., [1 l.] pl. ; ill.: 1 phot. ; 22 cm. Photographs : portrait after surgery. Subject : Ciliary & optic nerves — Transection. Author caption: By Charles Bell Taylor, M.D., F.R.C.S.E. ; Surgeon to the Nottingham and Midland Eye Infirmary. The accompanying photograph of a young girl who was sent to me. 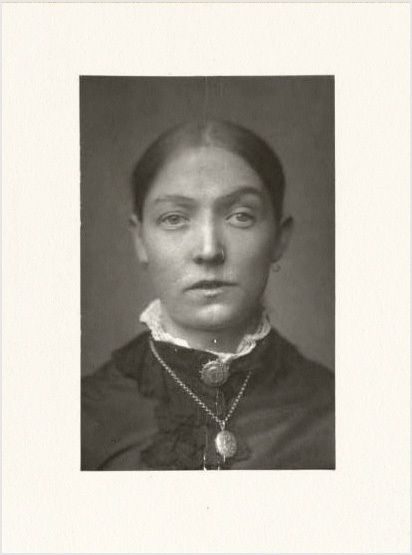 two years ago, in order that her left eye might be extirpated on account of pain occasioned by injury, with sympathetic irritation of the right eye, is an average specimen, certainly not the best, of the results obtained.—Page 352.